This portable laptop stand enables you to adjust the position of your laptop according to your line of sight, to increase your comfort and productivity. Itâ€™s fully adjustable with six angles, and features a compact, lightweight design, so you can take it along with your laptop to enhance your workstation anywhere you go. Placing your laptop for easy viewing helps to reduce neck and back strain. 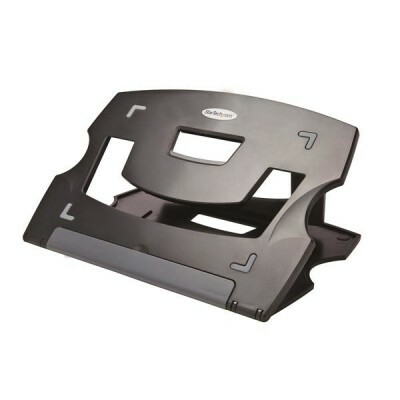 This laptop riser helps you to maintain better posture and work more comfortably, with six adjustable tilt angle options (15Â°, 17Â°, 19Â°, 35Â°, 37Â°, and 39Â°) to customize your work setup. Adjusting the angle of your laptop also provides a more ergonomic keyboard position. The platform's adjustable angle and flow-through design helps to increase airflow and keep your laptop cool while youâ€™re using it. This passive-cooling design silently protects your laptop from overheating, and helps to prevent unwanted problems due to overheating, such as slower performance and malfunctions. Its compact design (11.3â€ x 8.3â€ / 287 mm x 210 mm) provides a stable platform for your laptop, such as MacBook Pro, MacBook Air, Lenovo ThinkPad, HP, Asus or Dell Ultrabook. You can also use this laptop riser to hold your tablet in a comfortable position, keeping both hands free so you can type and swipe. This portable laptop riser is easy to carry around, so you can enhance your workstation wherever you go. The riser is easy to fold up and carry in your laptop bag. Itâ€™s ultra-thin (10 mm) and extremely lightweight (358 g), which is ideal for mobile use. The LTRISERP is backed by a StarTech.com 2-year warranty and free lifetime technical support.